Botanical Name: 1. Piper futokadsura Sieb. et Zucc. ; 2. Piper hancei Maxim. Part Used & Method for Pharmaceutical Preparations: The stems are gathered in summer or autumn, dried in the sun and cut into slices. Properties & Taste: Pungent, bitter and slightly warm. Indications & Combinations: Wind-damp obstruction syndrome manifested as painful and stiff joints, tendon and muscle spasms, lower back pain, painful knees and pain from external injury. 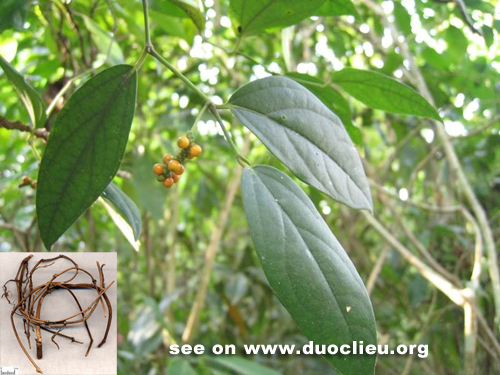 Futokadsura stem (Haifengteng) is used with other herbs that dispel wind and invigorate the circulation of blood in channels and collaterals, such as Erythrina bark (Haitongpi), Large-leaf gentian root (Qinjiao) and Mulberry twigs (Sangzhi).